Your dryer won’t start? Does it get overheated or not heated enough? There is always a good explanation for appliance problems. With experience and the right equipment, our techs provide troubleshooting and the necessary dryer repair in Morristown, New Jersey. We determine the cause of problems and offer solutions at once. Did you know that incorrect dryer installation can also cause trouble? There are gas and electric dryers out there and each model has different specs. But all vented dryers must be well connected for trouble-free air flow and thus good appliance operation. 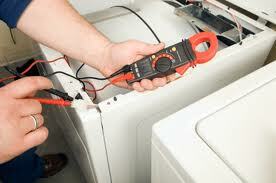 So, when you need any service related to clothes dryers, ask our help here at Appliance Repair Morristown NJ. Our dryer repair technicians in Morristown can install most brands and even the most advanced models. You can rely on us to set up the new laundry appliance to your satisfaction and at a time suitable for you. Since we always stand behind our work, we will be there to support and help you in the long run. You can always turn to our team if you want to maintain the dryer and thus keep it safe and operational for a long time. We are very flexible in scheduling dryer service appointments. So, call us. Of course, problems might always come up. Parts might break or simply wear over time. And anytime you are in need of repair services, we will be there to help. If you have a combo appliance, rely on our expertise in washer and dryer repair. Whichever model you own, contact our company if you notice that the dryer is acting up. We take into account the symptom to troubleshoot the dryer problems and find the solutions. Our techs have the experience to do the job in a jiffy and effectively. So, don’t hesitate to get in touch with us if you want expert and prompt dryer repair Morristown services. We will be there in no time.